It’s official; we are currently experiencing the best coho fishing in the Strait of Georgia since the mid 90’s. Lots of wild fish and lots of hatchery fish. For us the most productive spot has been out on the Hump. Just get out there and cover water and you will do well. The fish are basically in the top 60 feet of the water column so we are generally fishing 80 feet or shallower on the riggers, with plenty of fish up shallow. Wednesday I had one rigger at 57 with a 25 spread and caught lots of fish on my top rod and it was rough water conditions and dark and overcast. On the sunny and calm days the lower rods will do a bit better. White hootchies and white hootchies with some pink or red are producing well with a short leader around 26-28 inches. Purple flashers have been hot, like the Purple Onion in glow or non-glow, and Purple Haze flashers. Betsy flashers are also working well. I was talking to Tom, one of our guides, on the dock yesterday as he was telling me about a great charter and a limit of coho. The stand out point of the story was when he was telling me about watching a coho repeatedly attack his chartreuse cannonball at the side of the boat while he was getting ready to set his gear. This is a good example of how shallow the fish are and how aggressive they are. These are the kind of stories you expect from the Gwaii or Tofino, but it is happening right now in our won back yard. Without a doubt you could be bucktailing for these fish. There are all sorts of “lost” coho techniques that we just haven’t used locally over the past 20 years as the coho numbers haven’t been around to justify it, but they are back this year, so dust off the light rods and the bucktails and get out there. We have lots of bucktails and other coho flies at the shop, including some spinner blades to put in front of them. We are having some great action off Gabriola and Nanaimo for chinook. The fish are there; it is just a matter of getting over to them. The NW winds have made that pretty tough this past week, but we did manage to make it across on a few days. 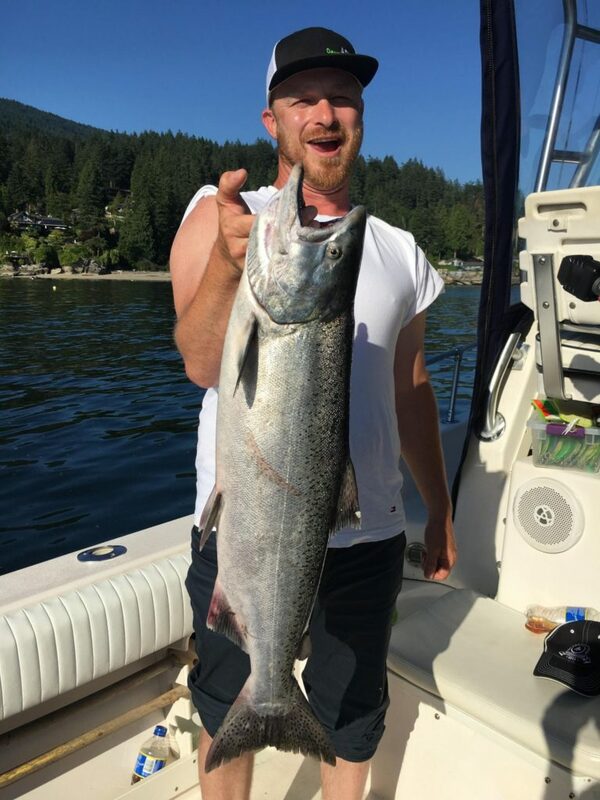 Jason with a nice chinook from Wednesday’s trip over on Gabriola. As per the last month or so, the fish are generally very close to bottom, feeding on herring, so that is where you gear needs to be. Chartreuse glow and green glow flashers have been very productive, like the Phantom, BC, Salty Dawg, Lemon Lime, and STS. Use a 28-32 inch leader to a glow green or chartreuse hootchy like a splatter back or just a pure glow hootchy. We have lots of these hootchies in stock at the shop and they are the ones we are using on the guide boats. We haven’t been focusing too much on the chinook closer to home as the coho fishing has been so good. That is going to change this next week though. 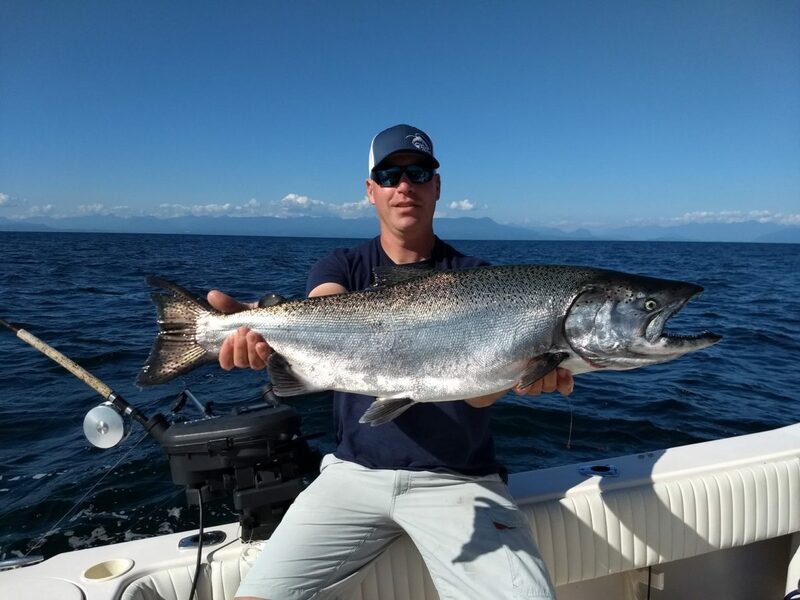 We always see the chinook fishing pick up a bit in the next 2 weeks as more and more Fraser fish start to show up and we will be ready for that. Some of my friends have already caught a fair number of chinook off the Bell Buoy and the North Arm and there have been some fish taken off the South Arm as well. It is not closed, just so we are all clear on that. The same lines that were in place last year are in place this year, so plot the lines and stay outside of that and you are good to go (plot a line from N Arm Jetty to S Arm Jetty). The exact lines, descriptions, and co-ordinates are on the DFO site. Remember these Fraser fish are shallow so hot depths are generally 75 feet or shallower on the downrigger. Bait is king, so we fish anchovies or herring on all 4 rods for this fishery. UV green or purple teaser heads, or chrome teaser heads on the top rods and glow chartreuse or green teaser heads on the bottom rods. Same system with your flashers, Betsy, Green Onion Glow, Purple Onion Glow on the top rods, and glow flashers on the bottom rods like Salty Dawg, BC, STS, Lemon Lime, Phantom, Madi. The sockeye are showing up, we have seen some jumpers and there are reports of some in the Fraser as well. The 50% probability forecast is 13.8 million fish. If we get that many we are going to see an opening. 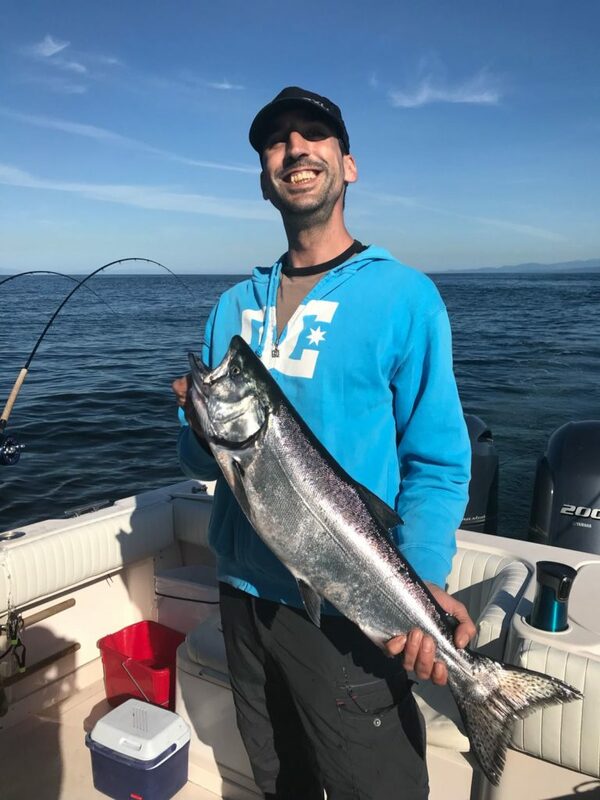 The early fish are always the smaller component of the run and are protected, as are the Cultus Lake fish, so there is never an opening until these fish have moved through and we get into the mid summer and later summer components of the run. This means we generally get an opening about mid August, usually on a weekend, so maybe we will see it open around August 18th. There are a lot of rumors that it is going to open, but I can tell you right now it has to do with the data they are getting as they do test sets on the approach areas. We are way to early for that data yet, so the rumors are just that. So for now, we have to sit back and wait and see. If the fish show up in good numbers it will open, if they don’t it won’t, it’s that simple. We won’t know more until the beginning of August. Well it is finally slowing down as the commercial has taken its toll, but we can’t complain as it was surprisingly good through most of July.